A dental bridge is a way to replace a missing tooth or teeth. Bridge dentistry involves attaching an artificial tooth/crown to adjacent teeth. It is done by preparing the adjacent teeth for crowns (a traditional bridge), or by having small “wings” attach to the back or sides of the adjacent teeth (a Maryland bridge). Unlike a denture that you can remove, a bridge is bonded to your teeth for stability and comfort. It restores the function of your missing teeth while looking natural. Getting a crown, onlay, or bridge generally takes two appointments. At the first visit, your tooth is carefully shaped and then a digital impression is taken of the tooth. This record is sent to our laboratory, where a highly trained Ceramist custom makes your tooth crown. Before you leave your first visit, a temporary restoration is fitted for your tooth. Your second visit will be reserved 1-2 weeks later. The temporary restoration is easily removed and your porcelain crown, onlay, or bridge is fitted and bonded. These restorations are long lasting and provide strength for many years. You can increase their longevity by brushing, flossing, and coming for regular cleanings and re-care examinations. 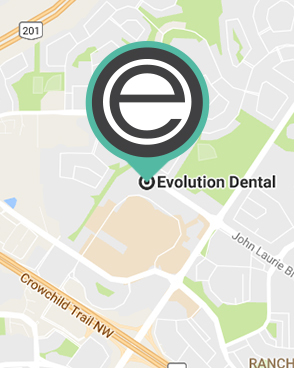 Call Evolution Dental at 403-208-9965 to learn about bridges and other tooth restoration options at our office in Calgary.